I woke up today with the weight of the fifth. It’s been twenty-one months and I wonder if I’ll ever skip this monthly routine and be able to breathe. Then I realized how scary that notion was and would much rather feel its pull on me. When I was thinking of what to write today, my mind sort of blanked. The other day I read about how one mom wanted to stop writing about her grief so her friends and family stopped worrying about her mental state. I instantly thought if my loved ones questioned mine. This has brought me perplexed feelings, mixed with the usual struggle I face. Is it so wrong to include him in my everyday life? As they soak up the sun, I’m braving the tundra to take care of their house and animals. Today, one of my tasks was sending out an Etsy order. My favorite woman who works at the post office was there and we struck up a conversation about our houses. I was describing how each room is painted and I got to Jensen’s room. The only room that isn’t similar to the rest of my house is Jensen’s room. My son’s, who died. She did a good job. When I talk about death or say my son died so matter-of-factly, I usually get this shocked face. I don’t even mean to say it so coldly, I just wonder if people hear me talk about him and they just don’t ever think I bring him around. Maybe they do know he died and just don’t want to bring it up either. I mean, it’s not a conversation ice breaker: how are you feeling about your child that died almost two years ago? As well as she did, I criticized myself when I got to my car. Did I say that just to hear his name or to talk about him with someone? Will the ‘he’s dead’ tagline ever stop? Do we ever really get over this whole awkward grief stage or can someone blossom into a confident grief? Is this even making sense? When I finally got back home, my mom and I FaceTimed each other. She said she was thinking about Jensen today and my dad had wrote his name in the sand for me to have. They took a picture and sent it to me today. I asked her if she realized it was twenty-one months today and she didn’t. It doesn’t feel like he’s been gone that long. It feels like yesterday that I was planning for his arrival and was starting my twice a week ultrasounds appointments; not two years. Although his body is physically gone from this world, his spirit is always around. He is remembered by pictures and J’s, stories and chocolate milk, and most of all, when someone says his name. I’ve decided, it doesn’t matter what anyone thinks. As I journey through life, I will continue to grieve the loss of my child. He will forever be apart of my story and I have no worries about how I live my life after loss. My intention for today was to feel any emotion that came my way all the way through. No matter if it was anger, sadness, or even happiness. The days not over, but I’ve welcomed each emotion and let it wash over me; just as the waves washed over his name. Christmas has snuck up on me this year. All the days a jumbling together and I feel like the world is spinning way to fast. Jensen’s stocking is hung and all his ornaments are adorned on the tree. I have a new book to read on Christmas Eve, which I scribbled, ‘Christmas 2017 – Jensen’s Second Christmas in heaven.‘ The lights are twinkling throughout my house and his candle shines bright in front of me. Yet, even though I’ve tried to make this time of year a little more gentle on my heart, I can’t help but focusing on how he’s not here. I would love to have him sit on Santa’s lap and immediately framed the picture when we got home. I would love to see him get excited for ‘Ho Ho’ to come and put presents under the tree. I would love to see him around his whole family tomorrow evening, playing and smiling like he should be. I would love to just hold him and tell him how much I love him every second of the day. Grief during the holiday season is not talked about a lot outside of the bereaved. It is so hard to be surrounded by joy when you feel like your insides are breaking down and dying. This time of year will never be the same again. The memories of his time in my belly and opening up his first Christmas book on Christmas morning will always be bittersweet. I just wish it was different for me and so many others. One of the things that’s gotten me through the last month has been the amazing community that continues to support us loss parents. We all feel so broken, but so many of us are there to help each other power through. It was my intention to share an ornament the last few days, but obviously I didn’t get to that. I wanted to share the ones I received this year today. They each have touched my heart differently, but have filled my heart. I also want to say, thanks to everyone who has sent Jensen a card. The cards I sent out will probably be late, like I said, it’s been a rough time. But, you are all in my hearts every day. I know there are so many others feeling the way I am, just wanting to make it to the next day. My favorite mistletoes, handmade by me. From Xander’s mom, Hayley. From Scared Sidless ornament exchange. Made by Kathleen. From the Remembering Together Ornament Swap. Made by Jasper’s mom, Amber. Everlee’s mom, Sarah, honoring Jensen and Huxley. December is here once again. This time it brings me to the twenty month mark and being in the midst of the second holiday season without Jensen physically here. Time has deceived me. It doesn’t feel like this many months have passed, I even had to count them twice to make sure. The second year of grief with the holidays is impossible to comprehend. Lately, I’ve been overwhelmed. I have not wrote a lot for others to read or have done a lot of self care. With my Etsy shop, school, and working, I can barley keep myself afloat on top of grieving and missing him each day. There’s a lot more going on too, it just isn’t the right time to share. The words that are bouncing around in my head don’t make sense when I put them on paper or screen. I’ve just been focusing on making it through the present day. There’s been a lot of deep breathing. In the past few weeks, I’ve been thinking a lot about the holidays, of course, and how different they would be with Jensen. I wonder what big present I would’ve got him or if he would have been afraid of Santa. Sometimes I just want to know if he would have snored or what would be his favorite movie. I’m constantly haunted with these unanswered questions and I would do anything to have them answered. This holiday season is different than last year’s though. You could say that there’s a ‘lighter’ feeling, but it doesn’t seem like the exact right word I’m looking to use. I guess I’m more open to seeing some of the good that’s going on around me. For instance, I decorated a lot more this year and haven’t had an anxiety attack when I’ve been Christmas shopping. I’m also not dreading the day of, but I’m still not big on the change of the year. Somehow it feels like if I’m just stuck in 2017, that I wouldn’t be even further away from him. I never thought I could make it here to this day. Almost everyday I’m shocked I can wake up on any given morning and my body not be broken. SO many people who never lost a child told me that time would heal me and my heart. I didn’t believe them then and I still don’t now. My heart hurts. There’s not a day that passes that I wish I could go back in time and deliver him a week earlier. I’ll always want another moment with him. Knowing I’ll never have that is the worst feeling. No one could possibly describe it. Just earlier today, I saw an informational ad about depression. They listed of all the symptoms and I just sort of laughed. What does it make me when I’m depressed for twenty months and most likely the rest of my life? I don’t really think about those questions, but with the contrast of the ‘happy’ and ‘cheery’ holidays, it really shows. For all this time, I have lived without my child and know that I will never see him physically again. Christmas music and lights don’t change that fact. Yes, I want to celebrate more and am open to that, but it’s still not the same. I guess I just would like to say is no matter how you feel during any point of the year, a grieving parent (and anyone really) has the right to feel whatever they need. We can’t get down on ourselves for not feeling what we’re ‘supposed’ to feel. This is a journey without any rulebook. Say their names. Tell their stories. No matter if it’s been twenty days, months, or years, our children did live. They matter and love never dies. Tonight, I’ll be attending a Christmas program from bereaved parents. I plan on updating everyone on how it goes and want to post a little more this month since school is over on the 13th. Continued thanks to each and every one who has followed me through my journey. If you need anything from me, even just to listen, please reach out. 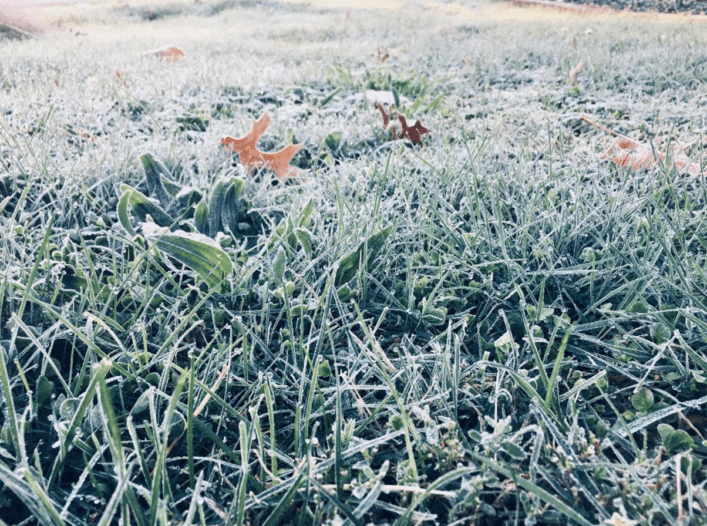 5 Tips to Tackle Grieving This Season. The upcoming holidays can seem like a daunting task to anyone who participates in them. They’re even more so when you’re grieving the loss of your child or children. I know just thinking about spending another Thanksgiving and Christmas without my son, Jensen, brings me such heartache. In my first year of grief, I wished there was a guidebook in how to journey through the long winter days. We all know this book doesn’t exist. What helped me tremendously was reaching out to other loss parents to talk, vent, and just share about my child and what was going on around me. Sometimes, I found myself in vulnerable positions without being able to reach out. Grief had tested me again. Through a lot of tears and running out of family-filled rooms, I learned a routine to help combat the mix of my grief and the holiday cheer. These are my 5 tips to tackle grieving this season. This may sound like a simple task, but in the heat of the moment it can be hard to catch your breath. For me, not seeing Jensen at Thanksgiving dinner or opening up presents really let reality hit me square in the face. I felt like I was hyperventilating in those moments. The world was spinning around me and grief was the one pushing it faster and faster. Then, I remembered to take a deep breath in and out. I was still living in the nightmare that is my reality, but focusing on my breath allowed me to take care of my mental and emotional needs. Grief has made me feel more emotions than I ever thought I had. I used to want to hide away some of the forceful ones like anger and envy. They made me feel like an ugly person. By ignoring those feelings, they were more likely to come back and in a much stronger wave. Recognize what you feel. In that moment, you’re feeling what you need to and maybe it will help you understand why. When I saw the little ones in my family with food all over their face, I was so angry. I wanted to project it on them, but I wasn’t angry at them. As I took my feelings in, I was able to understand I was angry Jensen wasn’t here with food all over his face. The more a person is in situations like these, the better it is to recognize the emotion and tackle grief before it snowballs. Take the moments as they come. This has always been my biggest challenge. When I think about living through the holiday season, I don’t see the days in-between the big ones. Everything is weighing down on me and I feel like I have to live through two months in one moment. We have lived through the worst days of our lives. No matter how different our stories are and how time feels when we look back on those days, we each took the moments as they come. That’s how we get through each and every day, before and after loss. Don’t take on these next weeks all right now. Take them as the moment comes. Small victories make big differences. Celebrate when you can and break down if needed. As hard as it seems, don’t feel guilty to celebrate or break down. It feels hard to think we’ll ever truly celebrate after loss and if we do, it’s not as full as it used to. That’s perfectly fine. Just don’t be afraid to smile or attend an event because your child isn’t there. Take something that reminds you of him or her and talk about them when you can. Give yourself permission to smile and enjoy a day. On the other hand, don’t feel as if you have to attend every holiday event or get-together. You are the only one who knows your exact grief. Don’t mistake this as a sign of weakness. If you do decide to attend and feel overwhelmed, I hope you remember to breathe, but it’s okay to breakdown too. Always know you’re doing the best you can. If none of these tips to tackle grieving this season help, I hope you can take away this very last one. You are doing the best you can. It might not feel like it in certain moments, but it’s true. No matter if you decide to stay in bed untilJanuary 2 or go to every get-together possible, you are a super hero. Wishing you all a gentle holiday season from my grieving heart to yours. This is how he would have looked last year around this time. Seven months old and going into his first set of holidays. 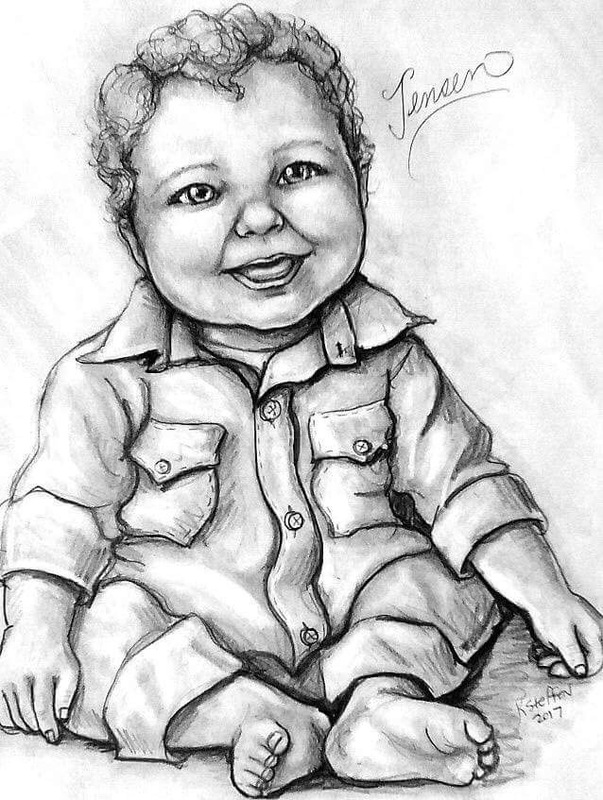 I won this portrait from For A Moment Portrait last year during Pregnancy and Infant Loss Awareness Month. When I won it, I was so excited because I never win anything and everyday when I woke up I pictured what he would look like. I still wonder what he’d look like since. She sent me Jensen age progressed to six/seven-ish months right before his birthday. I remembered being terrified to see what how it turned out. What if it wasn’t the way I had pictured him? Or what if my reaction was bad? It was the same feeling I had when Jensen bear arrived home. I built up the courage and carefully took it out of the envelope. My eyes were closed before I turned it over and saw him. No matter what it ended up looking like, I always had my image of him. So, I took the plunge. He had the curly hair inpictured and looked more like my mom than I had imagined, but it was definitely him. His eyes were opened, which I’ve never seen before. He looked happy and that brought me peace. Sometimes I wish I would get an age progression drawing for every year. Just to peak my curiosity. If I was any good at drawing, I’d do it myself, but I wouldn’t give him the justice he deserves. I’m not sure why I decided to share this image today. His smiling face has been right in front of me for almost seven months now. It didn’t feel right until now to show it off. Maybe it’s the time of year? Heading into the second holiday season without him and all I want is to see his face and how much he’s grown. Time doesn’t heal all wounds. My heart longs for him more and more as each day passes. I hate not being able to plan which presents he’d open up or decide when he should get a picture with Santa. And I wish for the everyday things, like making sure he was warm enough to go outside or wiping off food that missed his mouth. Time doesn’t make up for all the moment I should have had with him. It’s been nineteen months and the pain hasn’t lessened. Has it changed? Of course. But the weight in my heart is stil there. The tears still come. I’m still dreading the holidays and the year change. And in less than six months, I should have a two year old. Each day for the rest of my life, I know I’ll make it through. The smiling face I see in front of me now promises me that. I’ve lived the worst day of my life and I know it should be different, but I promise him and myself that I will be the best I can be. 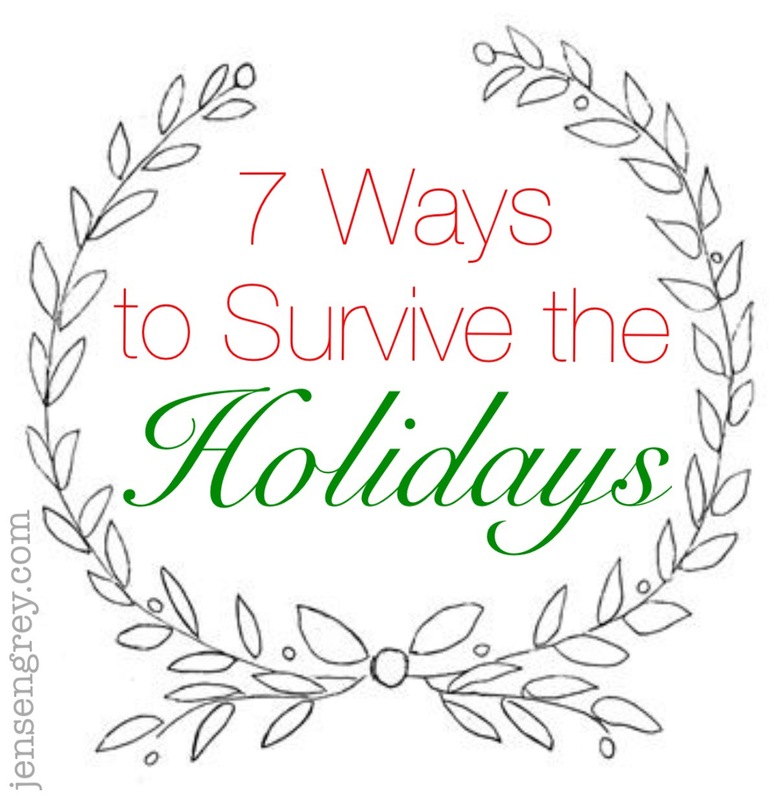 7 Ways to Survive the Holidays. ‘Tis the season for holiday cheer… or is it? With November comes the wave of Christmas and holiday, well everything. No matter where you go from now until December 25th, the barrage of music, Target decorations, and Black Friday store ads can be overwhelming for any person. Especially when a person is grieving the loss of their child. I can already feel the pressure of being cheery for the snow to settle and to count my blessings for Thanksgiving day. Here’s the thing, I’m not excited to make snow angels or say what I’m thankful for around the dinner table. I don’t want to see children my son’s age opening up their Christmas presents and sitting on Santa’s lap. On the other hand, I don’t want to feel like the Grinch stole this holiday season away from me honoring my son and how far I’ve come in my grief journey. I’d like to share with you some activities I did in my first year of surviving the holidays that really helped me. Last year I shared this article about how to honor your child during Thanksgiving, but I wanted to branch out on how to make the most out of an extremely difficult season of grieving. Okay, I know this one is pretty much for all year around, but it is so crucial during this time of year. Share your child’s name during this time, let people know how you’re feeling, and don’t be afraid to reach out. You’re doing the best you can. Not all of us are writers or artists, I get that; you would too if you saw me try to draw. In my experience, I get all these negative thoughts and emotions stuck in my head. Writing or creating something has helped give me an outlet to clear my mind. A journal can be one where you write or one where you paint or do something artistic. Even if it’s just an angry scribble or random words you write over and over again, they’re going somewhere other than your head. Believe me, I know the weight of grief during the holidays. It needs to be out. Don’t know what to write or create? There are many journal prompts on Pinterest and groups on Facebook or Instagram. Courageous Mothers is also providing a prompt a day through their program ‘Grief Journaling through the Holidays.’ The prompts began the first of November, but you can join through anytime. They also have a group on Facebook where you can share your thoughts on the daily prompts or just to go there for extra support during this time. Make sure to check it out and see if you would be interested. 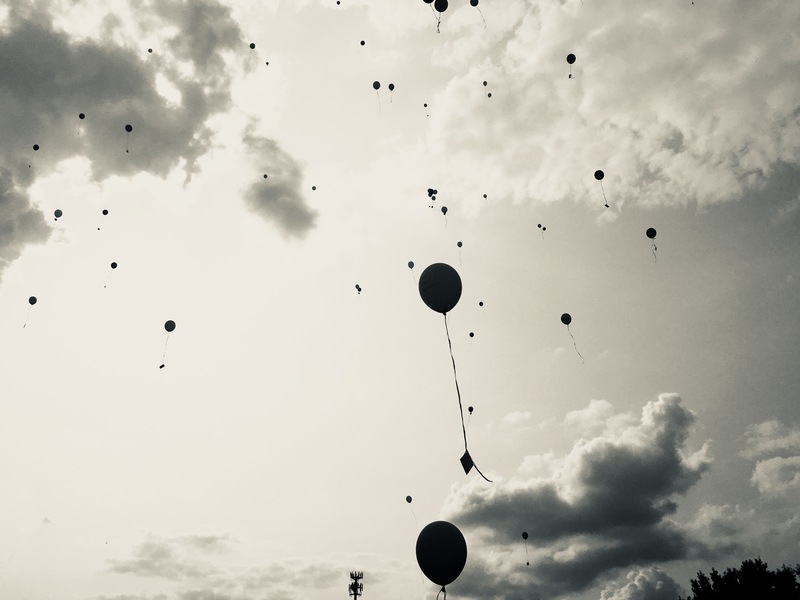 I am always amazed when I go to Pregnancy and Infant Loss events. The amount of people that attend can be so… heartbreaking, but each individual there provides so much hope and support. Last year, I was able to attended two events. Both were completely different and just as healing. The one was an outside event by the Angel of Hope in Stow, Ohio. Here parents, families, and support people were invited to light a candle throughout the ceremony. During this time, poems were read and a speaker talked about holiday grief. We were also allowed to present flowers to the angel or place them on the child’s brick, while being able to say their names. I blogged about this night on this post. For my parents who went with me, they really enjoyed being able to celebrate Jensen there and felt connected to our community. It was healing for them and me, which is so important. The other event I went to last year, was inside and more formal. It was in a huge church. They had a program and showed pictures of children gone too soon. The speaker there last year was absolutely amazing. It was a father whose son died from SIDS at daycare and just hearing him talk about his soon was heartwarming. He shared how tough the holidays are, but how they are able to honor him throughout them and their everyday life. I also blogged about this event, here. Events like these are individual to where a person lives. If you’re involved in a local loss in-person support group, they might be able to point you to gatherings near you. Before last year, I had never participated in an ornament swap; unless you count the ones in elementary school. I’m not really sure how I was introduced to the one I joined last year, but I am SO glad I was. Pretty much, you sign up for a swap, which deadlines are coming up soon, and you give what you would like to have in an ornament. Of course you give details about your child, what holiday you celebrate (religious or not), and how you decorate during the holiday season. Oh! The most important thing is every ornament in the swap is handmade. A few days later, you’ll get who you’re making an ornament for and learn about their child. It’s so healing to be able to connect with a person and their child that you’ve never met before. You are presenting them a way to heal and honor their child. That’s one of the greatest gifts you can give to someone who is grieving. Your child is also being honored and remember by another family. You don’t have to be super crafty to participate, just do the best you can do. This year and last year, I requested the ornament to be made with whatever came to them. It’s my belief that Jensen will work his magic in getting the perfect ornament for him. 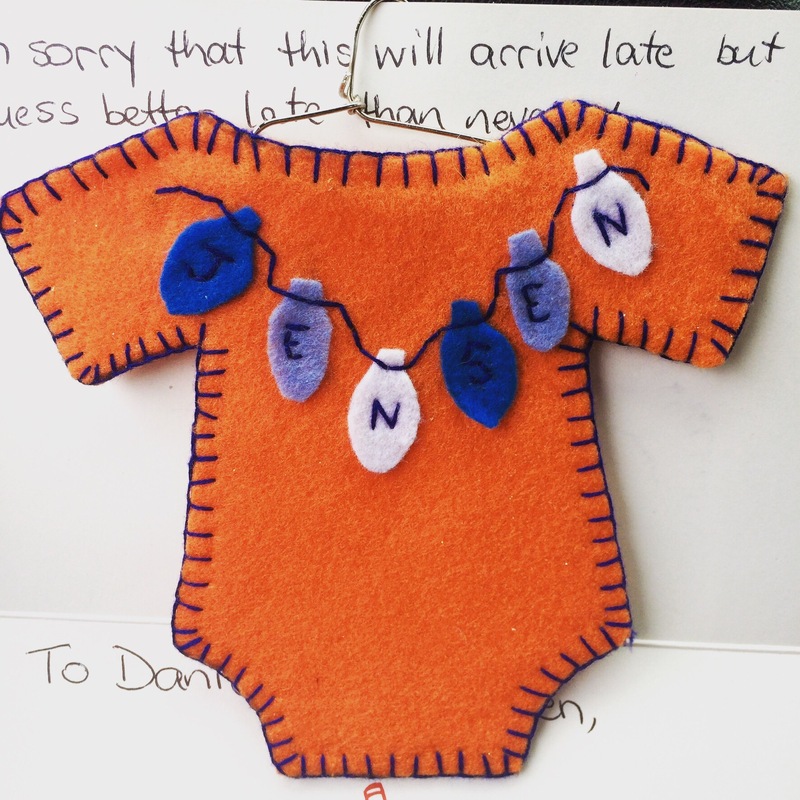 I also blogged about this experience and what happened when Jensen’s ornament arrived home, here. When I was a child, we rarely sent out Christmas cards. I only did a few times when I worked at a retail store and gave them to my coworkers. Instead of taking one with my whole family, I took pictures of me with my dog (who still lives at my parents). I always wanted to be able to send cards when I had a family of my own. When the first holidays came, I wanted to do something to honor Jensen and I. No, I didn’t send them out to family and friends, but I did share on here and social media. It was so healing to represent my little family and be apart of a holiday tradition I always had planned on. If you do take holiday pictures, feel free include your child. You can do this by holding their picture or Molly bear during your picture. If you don’t feel comfortable with those things, I have seen loss families add a certain symbol to all their pictures such as a butterfly or bird. When you sign from your family, add their name too. They are as much as a family member as anyone. 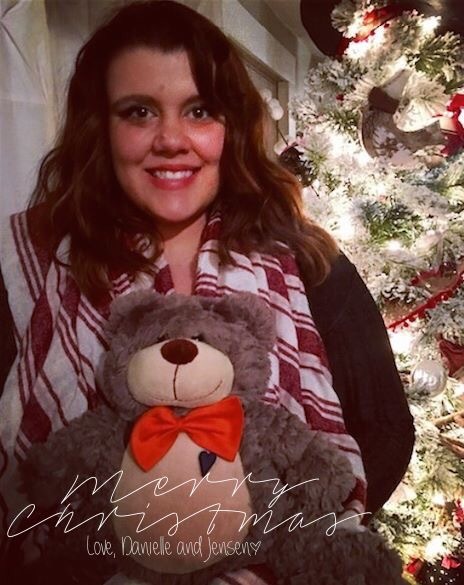 I was pregnant with Jensen during Christmas time. That year, I was constantly in and out of the mall buying gifts for my family and of course, Jensen. Every time I would go to shop, I would pass a giving tree and he would start kicking. Eventually, I took a tag off the tree and decided to donate a gift in Jensen’s name to a child who wouldn’t be getting the Christmas I was always used to. So, that began my tradition of honoring him. Of course, I didn’t know that it would be a way I could honor him then, but I continued my tradition last year. It felt really nice to be able to help someone in Jensen’s name. That’s what I try to do everyday. Knowing he is making someone smile after all the pain and heartbreak death caused, helps me keep going. You can find giving trees in local malls or you can even donate to churches or homeless shelters in your child’s name. Some Pregnancy and Infant Loss holiday events even take presents and clothes to children’s hospitals that you donate too. After loss, life completely changes. The way you do things or see the world is altered in ways you didn’t think was possible before. This most definitely includes the holidays. You and your family might have done a tradition since you were born and you don’t want to participate this year. Guess what? That’s perfectly okay. You are allowed to make your own new traditions. This means you might not feel up to going to certain holiday gatherings or putting up a tree. Instead of eating turkey for Thanksgiving, order pizza. No matter what you do, you’re doing what is best for your heart. That’s all you can ask from yourself. Don’t feel like you’re letting your child down or even your family members. Some examples of new traditions I did last year and maybe they’ll change again this year is making an ornament for Jensen (I didn’t want to buy one and go into the mall), setting an empty plate for holiday dinners, putting up a tree that represents your child, decorating their headstone or special place in your home, and writing their name in the snow. No matter how you decide to survive the holidays, know that there is a whole community ready to support and help you along the way. You are never alone in this journey. How I Honor My Son on Halloween. Halloween is most definitely a kid’s holiday. They get to dress up and be whoever they want to be, while they get all the candy their hearts desire. It’s full of fantasy and fun. Just what little ones love. For some, like myself, our children do not get to traditionally partake in the festivities. It’s the first holiday of the season and the start of complex grief. 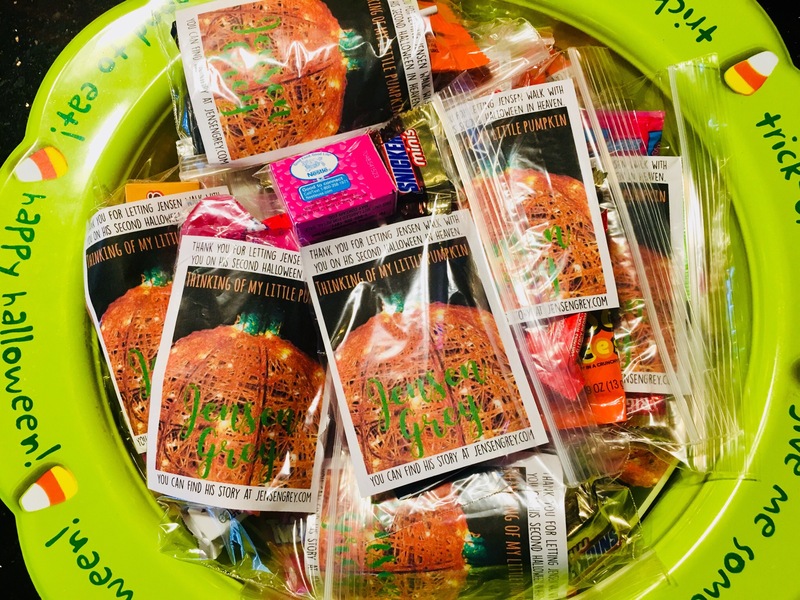 Even if a loss parent has living children too, they will always see their missing trick-or-treater. For mother’s without living children, it feels like they could hide away and avoid the entire night, which is perfectly fine if that’s what they choose. Last year was my first without Jensen. There was a lot of mixed emotions, but I felt like Jensen and I needed to be apart of the night. Honestly, I didn’t know how to pull it off. With a lot of thought I came up with an idea that I used again this year. 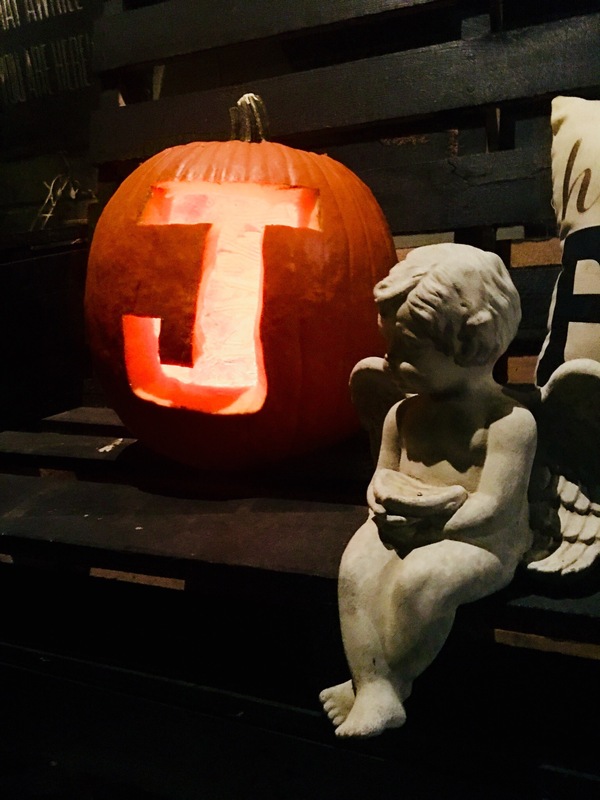 I had a graphic made with Jensen’s name on a pumpkin that said, ‘Happy Halloween to Heaven.’ Above and below the picture says thank you for letting Jensen walk with your child and to check his story out here. It was a great way to give back to neighborhood children while sharing Jensen’s story. I felt like this was a perfect option for me to be involved. As I said above, this year I did the same concept, but a different graphic. 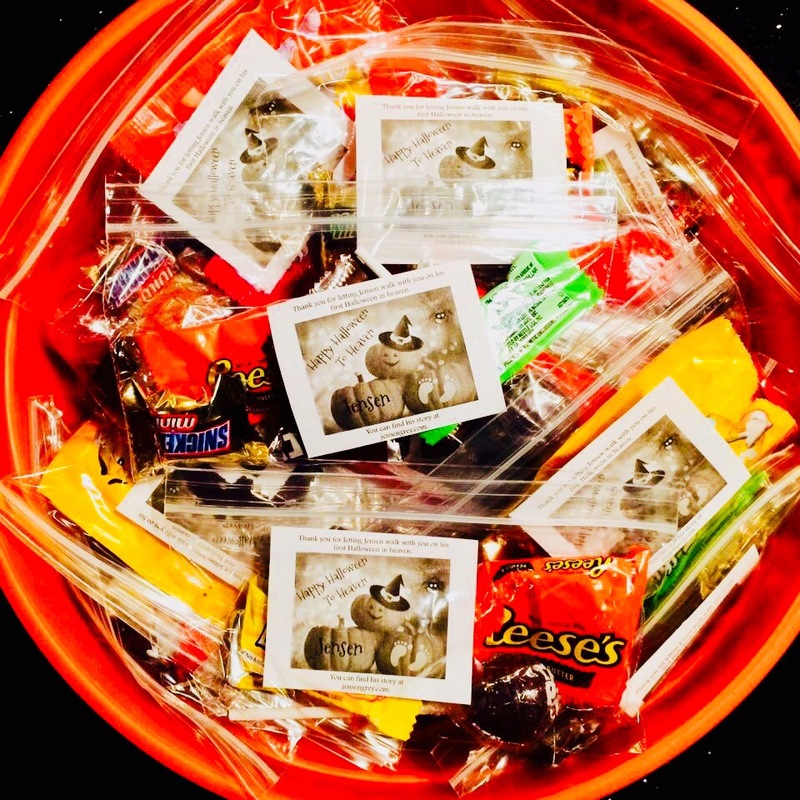 My mom and I packed the candy with the slips. It’s a way we can feel closer to Jensen and not let this night overcome our grief. This year, I also decided to carve a pumpkin for Jensen. Of course I used a big J to represent him on it. I love that I’ll be able to sit near his pumpkin and be able to pass out a little of his light with the candy tonight. It’s not a huge gesture, but it makes me feel a little more in control of my grief while making sure Jensen’s name never fades.